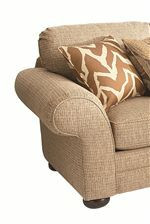 Cozy group seating the whole family will enjoy, this 2 pc. 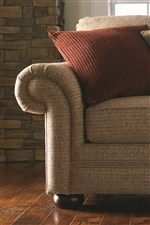 sectional features smooth sock arms and round bun feet. With an assortment of accent pillows and boxed edge cushions complete with a coil flex suspension, this sectional is not only stylish, but also durable and comfortable. Great for family and social gatherings, everyone will love this sectional sofa. 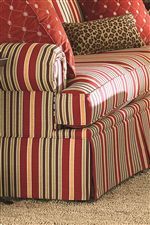 The Custom Upholstery - Manor Customizable 2 pc. Sectional with Sock Arms and Bun Legs by Bassett at AHFA in the area. Product availability may vary. Contact us for the most current availability on this product. 5000-41F Customizable RAF Sectional w/o Corner 1 59" 38" 38"
5000-66F Customizable LAF Sectional w/ Corner 1 96" 38" 38"